Elegant, beautiful and durable. Mexican all-weather wicker at its best! Elegant, beautiful and durable. Mexican all-weather wicker at its best! Made in Mexico by Mexican rattan artisans, this elegant, contemporary outdoor Mexican patio set will delight your aesthetic sensibilities and charm your guests. May be used indoor or outdoors. 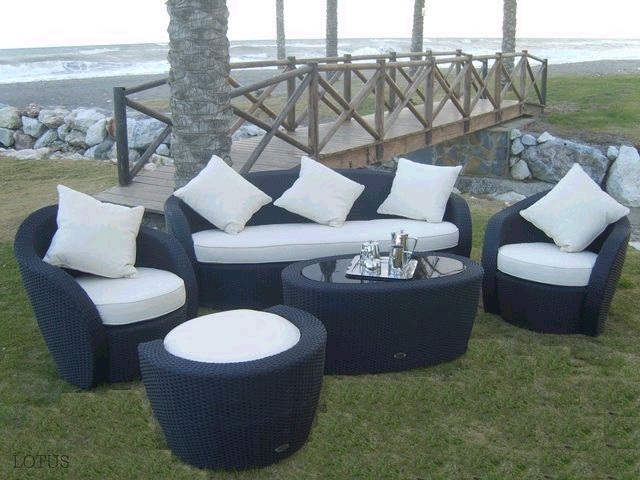 Woven over a sturdy and durable base of rattan. Set includes: sofa, 2 arm chairs, ottoman, coffee table. Seating for six including ottoman. Why do we name it Ixtapa? Ah, memories ... of the beautiful views, dazzling elegance and power of nature at the Westin Brisas Ixtapa during an unforgettable visit. This outdoor set is a showstopper!